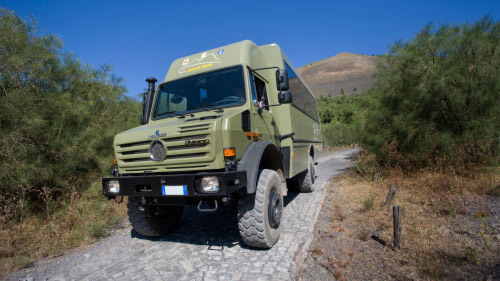 Explore Mount Vesuvius in a 4×4 ecological off-road vehicle which takes up to a point from where a 30 minute walk will take you to the crater’s edge. taking in spectacular views across the Gulf of Naples. Then, enjoy lunch and a wine-tasting session at a local Vesuvius winery. The day starts with a comfortable and scenic one hour drive by coach from central Sorrento to the foot of Vesuvius National Park. You then change over to the all-terrain low-environmental impact vehicle, equipped with 27 seats. As you ascend the side of the volcano, you will enjoy spectacular views over the Bay of Naples towards Sorrento and the island of Capri. Following the Vesuvius ‘Experience’ you will taken to the Le Cantine del Vesuvio winery, to learn about the wine-making process and sampling their white, red and rosé wines. Lunch will include bruschetta with local cheese and salami, spaghetti or pasta, and a traditional Neapolitan Pastiera pie followed by a taste of traditional grappa, an alcoholic spirit. Entrance fee to Vesuvius, 10 euros pp, is not included and is paid on site.